The State has been extremely fortunate in its Surveyors General of the past who were all men of outstanding personality, and it must always be remembered that in the early days and indeed for the first fifty of settlement [by Europeans], the next ranking position after that of Governor, was that of Surveyor General. Doug Tomlin & TA Cleave, ‘The Surveyor in Western Australia’ in Cartography in Western Australia. Letter of appointment dated 5 December 1828, engaged from 28 December 1828. 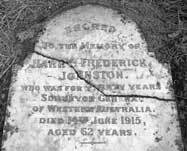 Relinquished the position at noon on 29 December 1890 to become Treasurer and "Premier" of Western Australia. No Surveyor-General appointed during this period. Commenced July 1896. Died in office. The Johnston Lakes were named after the Surveyor-General by Frank Hann on 9 September 1901.
d 21 February 1931 (New Guinea) Commenced 1 March 1918. Retired 30 June 1923. Lake King was named in his honour. d 18 April 1943 Lake Camm was named in his honour. d 17 January 1982 Commenced his first term of office on 24 November 1938. Commenced 1 Februry 1945. T S Parry was Surveyor-General during the period that W Vernon Fyfe was the Director of Land Settlement. Resumed the position of Surveyor-General on 22 February 1948 and retired 7 April 1959.
d 16 April 1990 The son of John Percy Camm (Surveyor-General 1923-1938) and Sarah May Camm nee Chamberlian. d 13 April 2010 The Morgan River is named in his honour. Anon (1931) 'The Death of Mr H.S. King: Former Surveyor General' in The West Australian 24 February 1931. Hann, Frank H (1998) Do Not Yield to Despair: Frank Hugh Hann's Exploration Diaries in the Arid Interior of Australia, 1895-1908 Hesperian Press, Carlisle.